Portfolio Shares, Income Booster & The 4X (FOREX) Factor. Please join and become a follower ! 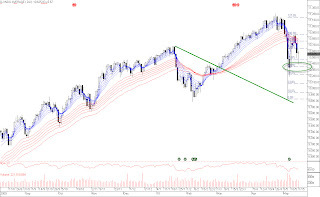 Last nights movement has seen the Dow Jones bounced off the 50% retracement level during the last session. The resistance level that has become support over the last couple of weeks came in on high volume and we have now the 3rd day down. 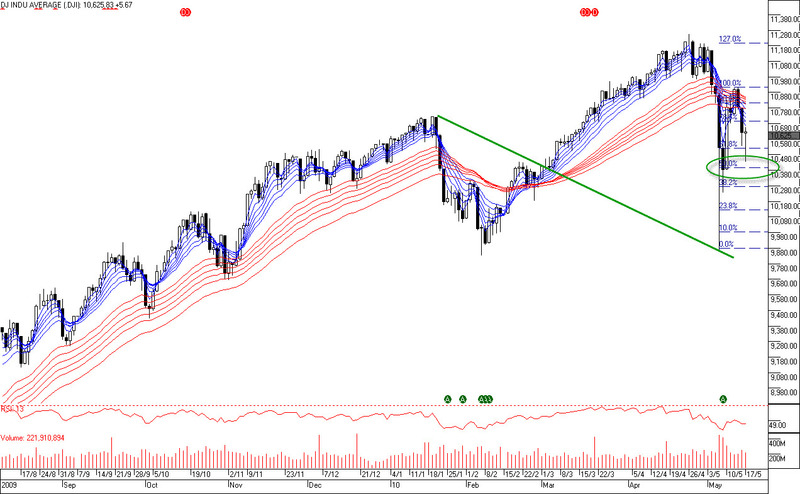 The next couple of days will be crucial for the future direction of the indexes as a whole. If we get a move to the long side over the course of the next couple of days then we would expect this market to continue this current bull market to continue. Will update over the course of the next couple of days as too future direction of the markets. What happened to cause 1000 point drop in the Dow? What caused the Dow Jones Industrial average to fall 1010 points or close to 10% during last Thursday’s session? Like most instances it appears that it wasn’t caused by one single factor rather a combination that culminated in a wild roller coaster ride that for 20 minutes caused the fastest and largest percentage drop since the 1987 stock market crash. Global markets have been transfixed with the situation with Greece’s sovereign debt issue and the worry that this will flow into other areas of Europe and consequently the global. This uncertainty has driven the markets down for the last couple of weeks but with all this uncertainty and fear in the markets the Dow Jones was down just on 4% from its highs prior to last Thursday. At 11am the Dow Jones Industrial Index was down 60 points with the selling volume being heavier than normal. The number of stocks that fell without first moving up was at its highest level since the terror attacks of September 11. It is now 2pm and the Dow Jones is down just over 200 points and all financial markets where feeling the strain. European equity markets were down solidly from the spillover from the Greek Debt Crisis. The Euro and Yen were both down solidly against the US Dollar and the bond markets were solidly sold off. Shortly after 2.15pm in Santa Monica, California, hedge fund Universa Investments that manages close to $4 Billion USD, placed a trade for 50,000 S&P500 Put Contracts worth approximately $7.5 Million. Normally such an order wouldn’t put a ripple into the market, but on the Chicago Board of Exchange on this particular day, this was the straw that broke the camels back. The traders who had taken the other side of the order went to hedge there position in the market by selling futures contracts into the market. Other traders went on to hedge their bought futures contracts by selling physical stock on the New York Stock Exchange and NASDAQ Exchange. The hedging that takes place is all done via computers and at super-fast speeds. Computer trading was stopped after the 1987 Crash and deemed illegal by the exchanges. Computer trading now accounts by some estimates for more than 2/3rds of the volume of the New York Stock Exchange and the theory is that it provides much needed volume and conversely liquidity for the market. The sheer volume of the orders generated by the program trading clogged the Arca Electronic Exchange and orders that normally take 1/300th of a second to execute were now taking 2 minutes to be actioned. With the huge volume of orders going through the market, the people that control the some of the super-fast trading hedge funds, that provide much of liquidity for the exchanges, pulled out of the market altogether in an effort to find out what had happened with the market. The computers were moving faster than the human brain could comprehend. These computers that normally supply volume to the market and allow traders to execute their trades in a timely and fare manner, disappeared. When this happened, there was literally no-one to buy any shares. I one extreme case Procter and Gamble went from $63.00 a share to $0.01 in under 20 minutes. The exchange later corrected the trades. By 2.40pm in the afternoon the overload had taken it toll on the NYSE’s Arca electronic trading system. Other exchanges including NASDAQ and the Philadelphia Stock Exchange detected questionable information in the data and stopped routing orders through to the Arca System, effectively “pulling the plug”. 3pm and the selling pressure had stopped due to all the automated computer links being reset and the market climbed quickly. One factor behind the swift recovering was the same computer programs that forced the fall in the first place, now detected good value in the market and bought stocks up across the board cheaply. This rollercoaster of a ride is yet another symptom of a financial system that is still has to be corrected from all the lax regulation over the last 10 years. The global financial crisis was caused by the inability to value mortgage backed securities. The laws that were in place from 1932 to stop the collapse of the financial system by banks becoming to large were repealed in 1999. The “up-tick” rule only allows “short selling” once a stock has moved up in price became part of the market rules in 1932, it was removed to allow increased volume from computer trading in the mid 1980’s and then reinstated after the 1987 stock market crash. Over the last 10 years it was then removed again and then in 2008 was reinstated. After everything that has happened during the last couple of years and with the damage that it has caused to the global economy is seems amazing to me that the rules that were put in place after the worst bear market in history to prevent it ever happening again, have been so easily cast aside by the authorities. For those of you that follow my work will know that I am a big believer in cycles both in and out of the financial markets, and that unfortunately in some cases history repeats itself time and time again. There will be an analysis of what has happened over the course of the last couple of years in the financial markets and in the economy and “new” laws and regulation will be put in place to “protect” investors and the cycle will start again. Maybe the people that we should be protected from are the Government officials who think its OK to tinker with financial market regulations. Ohh well the RBA does what it says it needs to do. Up 0.25% or 25 basis points just a minute ago. This should well and truly cool the housing market now. Time will tell but those of us here are split on whether the RBA will or will not raise rates today. Personally I am hoping that the cooling we are seeing in housing will be enough to put the brake on the RBA for this month at least. After all the RBA Gov said that if they had known the pullback had occurred in housing before the last rise they would probably have held off. So who knows maybe this time they will heed their own advice! Just one of those days today ASX opened up then looks like spending the rest of the day going back to its starting point. Ok my trader sense (bit like spidey sense but different) is twitching and telling me that the island reversal we are getting today is a sign of things to come.